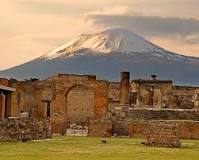 Most people have heard the story of how Pompeii was destroyed by the volcano Vesuvius in 79 AD. So much of the mountain was blown away, that it looks like two mountain peaks today. It was an ancient Etruscan city and then conquered by the Romans. The volcano spewed out very hot ash that killed everyone instantly. Roofs of wood caught fire and were destroyed. The walls of buildings, frescos on the walls and roads are preserved as they were then. You can enter homes that were large even by our standards today with indoor pools and gardens. The streets ran down hills. They opened pipes at the top to allow water to run down the street and take dirt and garbage with it. Crossroads had speed bumps that acted to both slow down a horse and carriage and allow pedestrians to walk across the street without getting their feet wet or dirty. This city had bars, brothels, restaurants and arenas. It was a more modern city than we think of for that time. As you walk these ancient streets you feel as if you are there in that time. You keep an eye on Mount Vesuvius which looms over the city. From Rome you can catch a tour bus to Naples and Pompeii. It is a day trip with an hour or two stop in Naples and two hours in Pompeii. This is followed by lunch and a return drive to Rome. From Naples it is very close. In fact you can see the monster Vesuvius easily from Naples. 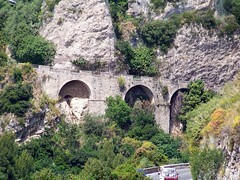 Driving south from Rome or Naples you pass Pompeii on the way to Sorrento and the Amalfi Coast. You can catch a bus from Naples to Pompeii and then Sorrento. From Sorrento take a ferry to Capri. The drive is an easy one as the highways are great. Driving past Mount Vesuvius is an awesome experience. Such power and destruction. Looking at the mountain (see picture) you see what looks like two mountain peaks. It is actually one with the entire center blown out. This cataclysmic blast is what destroyed Pompeii in 79 AD. The blast rose 15 miles up and was moving at 62 miles per hour. No one could out run it!